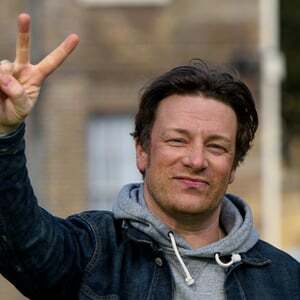 Jamie Oliver was born in Clavering, Essex, England and was raised in Cambridge. His parents, Trevor and Sally Oliver owned a pub called The Cricketers, where Jamie first got his taste of the restaurant business. Jamie would help out around the kitchen when he was just a small child, and as he matured, so did his desire for the culinary profession. He attended the Westminster Catering College at the age of 16, and soon after began working in France and then moved on to take a position at Antonio Carlugios’s Italian restaurant, The Neal Street Restaurant, as the head pastry Chef. The Neal Street Restaurant is one of the best noted restaurants in England. Next, Jamie was employed at The River Café for three and one half years. Jamie’s media career really took off after he appeared in a documentary for the restaurant called “Christmas at The River Café”. After seeing the documentary, offers came flowing in for Jamie to have his own show. And thus The Naked Chef was born. But Jamie also has another television series called Jamie’s Kitchen where he trains 15 young people in the restaurant business as chefs, and puts them to work in his very first establishment, called Fifteen. The Fifteen program provided training for young people in three locations around the world. Along with the “Fifteen” restaurants, Jamie also is co-owner of the Barbecoa Restaurant in London. Jamie Oliver is not only the owner of several popular restaurants, but he is also the author of several books such as “Jamie at Home: Cook Your Way to Good Health”, “Jamie’s Thirty Minute Meals”, “Happy Days With the Naked Chef”, and more. He has also appeared on several television shows such as, Top Gear and Iron Chef America. Jamie Oliver is all about teaching the world how to eat right and stay healthy. He has put his best foot forward in the battle against unhealthy lunches for our kids, as well as continually spreading the word on better ways to feed your family, through his television appearances, tours and books.